Stenting Stenting is the process of placing a stent, which is a mesh of wires, in the blood vessel to assist in keeping the vessel open. The procedure begins with the use of angioplasty where the vessel is opened and cleared using a balloon and usually medicine. Stents usually are made of metal mesh, but sometimes they're made of fabric. 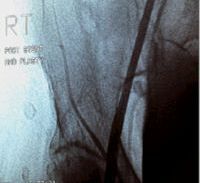 Fabric stents, also called stent grafts, are used in larger arteries. Some stents are coated with medicine that is slowly and continuously released into the artery. These stents are called drug-eluting stents. The medicine helps prevent the artery from becoming blocked again. 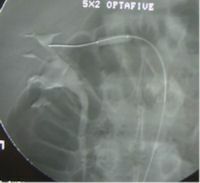 Stents are placed around the deflated balloon at the end of the catheter. The catheter is then moved into the area of concern. 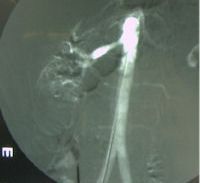 Once the stent is in place the radiologist inflates the balloon. 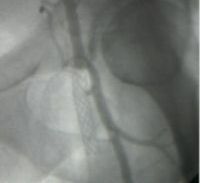 The stent adheres to the walls of the artery and the balloon is deflated and the catheter is removed. Over time, the cells of the artery absorb the stent which allows the stent to stay in place. 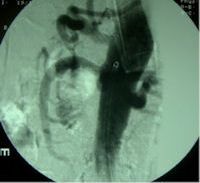 The entire procedure is done using fluoroscopic guidance. The Iliac Artery is a common term which refers to the common, internal and external iliac arteries. These arteries run down both sides of the pelvis and provide blood flow to the pelvis and lower extremities. Peripheral artery disease (PAD) can affect these arteries which can cause pain to the thighs and legs. In severe cases, PAD can cause painful sores on a patient’s toes and feet. If the circulation does not improve, the ulcers will become dry, gray or black, and eventually gangrenous. The process includes angioplasty and placing a stent in the artery to restore blood flow and reduce or eliminate pain to the legs. 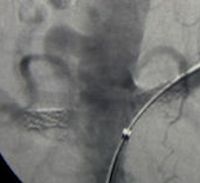 Prior to stenting, patients who required intervention for iliac artery issues would have to undergo surgery for bypass grafts. The Renal Arteries are those two vessels that supply blood to the kidneys. When the arteries to the kidneys become constricted, this creates what is call renal artery stenosis. This triggers a release of hormones to the body causing hypertension, also known as high blood pressure. There are several factors which can cause narrowing of the artery, the most common is atherosclerosis, which is hardening of blood vessels due to buildup of plaque. Renal angioplasty and stenting restores blood flow to the kidneys, reducing hypertension and allows the kidneys to operate properly. The celiac artery supplies blood to the liver, stomach, abdominal esophagus, spleen and the superior half of both the duodenum and the pancreas. The Superior Mesenteric Artery provides blood flow to the lower half of the duodenum, appendix and parts of the colon and pancreas. They are the major branches of the abdominal aorta. 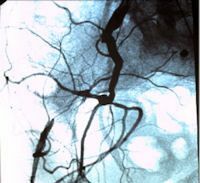 A celiac or mesenteric angiogram can detect or rule out aneurysm, thrombosis, ischemia, and can be used to locate the source of gastrointestinal bleeding. It can also aid in the diagnosis of portal hypertension and cirrhosis. A stent or stents may be placed in the disease areas of the blood vessels to restore flow. 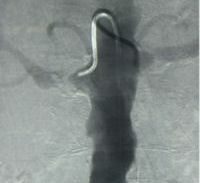 Stents are also placed as stent grafts to create new vessel walls in the case of an abdominal aortic aneurysm.